From the soul’s point of view, everything in your life centers on you learning in time to become the source of love for yourself. That’s why you were born–that’s it in a nutshell. That’s why every human is born. People model for you what love is and how to love, and then you are tasked throughout your life to develop love and care … often for others, but ultimately learning to put yourself first in a healthy way so you can be there for others when it’s right and healthy to do so. Ceres matters because it’s all about how you treat yourself and others: If you protect and provide for others, if you mentor others, if you parent literally or figuratively. And how you treat others isn’t necessarily a parallel with how you treat yourself because people living Ceres stories often care for others while downplaying, ignoring, or blowing off their own needs. Balance in care for self and other is crucial to learning to be the source of love for the self, and Ceres in our lives can reveal the sources of imbalance. Are you wondering why you haven’t heard much about Ceres? It was promoted to the status of dwarf planet from asteroid in 2006, and we’re just about ready to begin discussing the role of protection, safety, and care in our conceptions of if we feel loved, supported, and safe in the world. I’m intentionally inserting this info on Ceres this year to bring more attention to this important archetype. To support you in learning more about becoming the source of love for yourself and coming out of old patterns and assumptions about what love and care are, I’m facilitating a festival of Ceres from April 20-26, 2019. 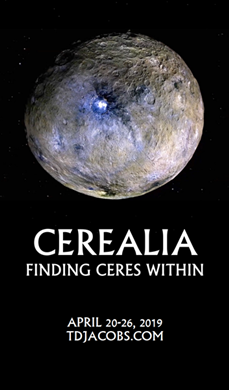 Cerealia: Finding Ceres Within is an internal, home-study process you’ll undertake with daily channeled material from Ascended Master Djehuty (a.k.a. Thoth, Hermes, St. Germain, Merlin) to unlock old patterns and beliefs that might not serve you. You have the option of adding in a 15-20 minute mp3 minireading on your own chart’s Ceres configuration if you sign up by April 1. Reading channeled texts from Djehuty helps us open doors into places under the surface we normally don’t have access to. Then the questions for reflection for each of the 7 themes of the day are designed to help you release old patterns as you come into conscious awareness of what you believe, and why you’ve had the patterns you’ve had. For more on the myth, archetype, and astrology of Ceres, check out my Ceres playlist on YouTube. There’s a 75-minute astrology/myth/archetype presentation plus three “Ceres in the Birth Chart” videos containing analyses of 6 natal charts’ Ceres configurations and others. Read all the details and register for this unique healing event here.